What was discussed at the 31st African Union summit in Mauritania this weekend is about as newsworthy as the fact that the country pulled off the summit at all. There was the usual talk about continental conflicts, a whole debate around this year’s theme of corruption, and some inching closer to the African Continental Free Trade Area. 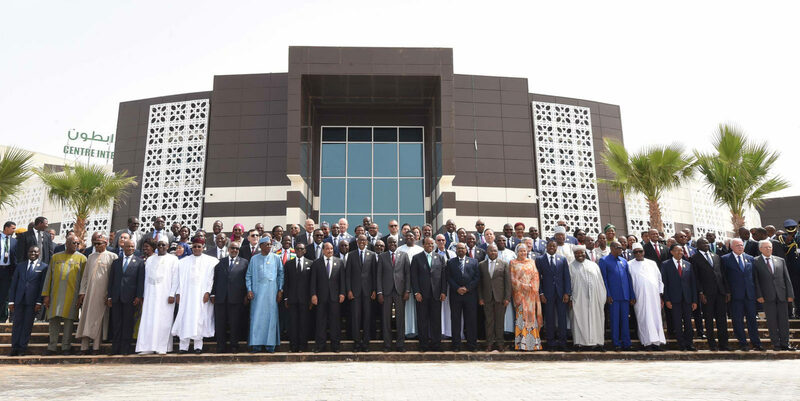 Much like the continental body’s ambitions to silence Africa’s guns by 2020, having a summit in the desert capital Nouakchott (population one million) was an ambitious, almost impossible feat. Six weeks before the June 25 start date, the grand conference centre was a mere foundation, and the hotels on offer seemed frighteningly inadequate. But the summit did happen, even though it felt a bit like driving on a road while it was still being paved. Plug points in the building were still wrapped in masking tape, the second floor toilets hadn’t been finished yet and some building dust and scraps of rubble still lay about on the floors. Even the headsets provided for the interpretation of speeches in at least four different languages were fresh out of the box. In fact, outside the complex, a detour to the airport from the conference centre was hastily constructed and tarred in a mere day, hours before the first head of state touched down at the Nouakchott-Omtounsy International Airport, about five kilometres from there. The conference centre itself is about 20km out of town in lieu of planned development of the city that way (which one day could be fuelled by offshore oil and gas currently being explored by BP). The distance, however, made logistics a bit tough. For one, the accreditation badges for the summit were being distributed by officials who were supposed to have been meeting delegates at the airport before some flights were delayed and before the badge production process experienced hiccups and crashes. So instead, these officials waited around in the conference centre with the badges while security stopped all those unaccredited, 300 metres before the conference centre. Many a badge was therefore handed out by the side of the road, right there in the desert sun and sand. Also, one of the interpreters said she spent a large chunk of her daily subsistence allowance – about $50 – for a taxi to the conference centre. (Summit inflation is real.) Fortunately the organisers later laid on buses for the lowly officials (and journalists) who did not have one of the shiny accredited cars which drove like emergency vehicles through Nouakchott’s scant traffic, which helped a lot. Accommodation worked as a great equaliser, however. Heads of states were assigned the villas their rich owners volunteered to the government for the summit (the villas on the beach near the conference centre were not finished on time), but with no Sheraton or Radisson Blu in town, ministers and ambassadors ended up staying in the equivalent of a two- or three-star hotel. There were also stories of journalists pitching up to non-existent hotels they booked online, and another lowly official said she was made to pay her total bill upfront, in cash, before being allowed to check in. Also, as there was no alcohol (Mauritania is a Muslim country and tipple is illegal) it was a remarkably hungover-free summit. A local expat even speculated that delegates with the means would, as happened during another recent summit here, commute by private plane from St Louis in Senegal, 300 km to the south, where there is plenty of opportunity for indulgence. The summit opened a surprising less than an hour late, but delegates and ministers waited around impatiently for the next open session, which started a couple of hours later than scheduled and only ended around 21:00 on Monday night. Opening speeches correctly referred to Mauritania as a hospitable country, and one or two speakers referred to its reputation as the land of a million poets. The French government has previously issued a warning about terrorism and possible kidnappings in Mauritania, which are uncommon but do sometimes happen. Nothing was said about this, but still, security for the summit was strict, with armed soldiers intimidatingly clad in tight black uniforms, balaclavas and sunglasses, keeping watch along the road to delegates’ hotels and the conference centre. The deadly bombing of a military base in neighbouring Mali shortly before the start of the summit and a car bomb targeting French soldiers on Sunday, one day before French president Emmanuel Macron’s visit to Nouakchott on the sidelines of the summit, cast a shadow over proceedings, as did the failure of a recently negotiated ceasefire in the South Sudanese civil war. President Cyril Ramaphosa led a meeting of concerned countries on South Sudan on Saturday, before the heads of state summit started. Defence minister Nosiviwe Mapisa-Nqakula said the continent’s leaders have lost patience with the warring factions there (nothing new here) and that former vice-president and rebel leader Riek Machar might return to South Africa “if the people of Sudan [where he currently may be] or the region decide it’s not time for him to go back to South Sudan”. She didn’t use the words “house arrest”. Ramaphosa also finally signed the African Continental Free Trade Agreement on Sunday after declining to do so at the special summit in Kigali in March, where 44 out of the 55 AU member states signed. South Africa needed to run the agreement by law advisers first, and will now take the agreement to be ratified in the SA Parliament. Sierra Leone, Lesotho, Burundi and Namibia also signed the agreement on Sunday, but Nigerian foreign minister Geoffrey Onyeama told Daily Maverick his country needed to finish its internal consultation process first before committing to anything. This means South Africa is the biggest economy to have signed the agreement so far. In the later open session, leaders debated this year’s theme of corruption, which wasn’t much of a debate, as they all agreed that it’s bad. A rather fragile-looking Nigerian president Muhammadu Buhari, who is gearing up for an election battle at home in 2019 which could take him into his second term, said his experience from trying to make good on his last election promise of cleaning up his country’s notoriously bad administration is that “corruption will fight back”. Ramaphosa, in turn, also speaking from experience, said the fight against corruption needed “to be taken up by all sectors of society and citizens”. In his first speech at an open AU plenary he said that “those in South Africa who peddle corruption, have found parasitic ways to set up networks” and “even capture government departments and state-owned enterprises”. On Monday morning, before the close of the summit, Ramaphosa will preside over the renaming of a street in Nouakchott after former president Nelson Mandela, whose centenary is being celebrated around the world this year. The Mauritanian capital has thus far been one of the few on the continent without a road named after the revered father of South Africa’s democracy.